Floyd Mayweather said in an interview with TMZ Sports on Wednesday that he would fight Khabib Nurmagomedov, UFC’s newest star. The fight would be Mayweather’s second against a mixed martial artist, having defeated Conor McGregor in the 10th round of a similar crossover bout in 2017. Mayweather even called McGregor his “leftovers” as he scoffed at Nurmagomedov’s recent fourth-round submission victory over the Irishman. A boxing-rules contest with Nurmagomedov would show that Mayweather has moved on since announcing on social media that he would engage his old rival Manny Pacquiao in a rematch this December. Pacquiao is likely to fight Adrien Broner instead. “Oh, we fighting,” Mayweather told TMZ Sports in response to growing rumours that he could welcome Nurmagomedov, the UFC lightweight world champion, into a boxing ring for a crossover fight. 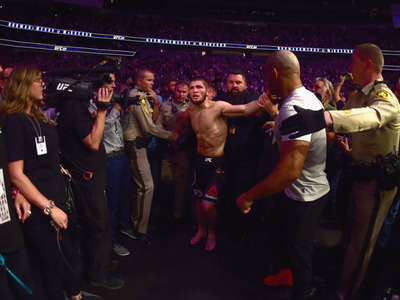 Nurmagomedov was thrust into the limelight after he dominated McGregor at UFC 229 on October 6. The Russian wrestler outmuscled McGregor, dropped him with a thudding right hand in the second round, then submitted him with a tight neck crank in the fourth. A melee broke out immediately after Nurmagomedov’s win when he jumped the octagon fence and charged at McGregor’s cageside friend Dillon Danis. 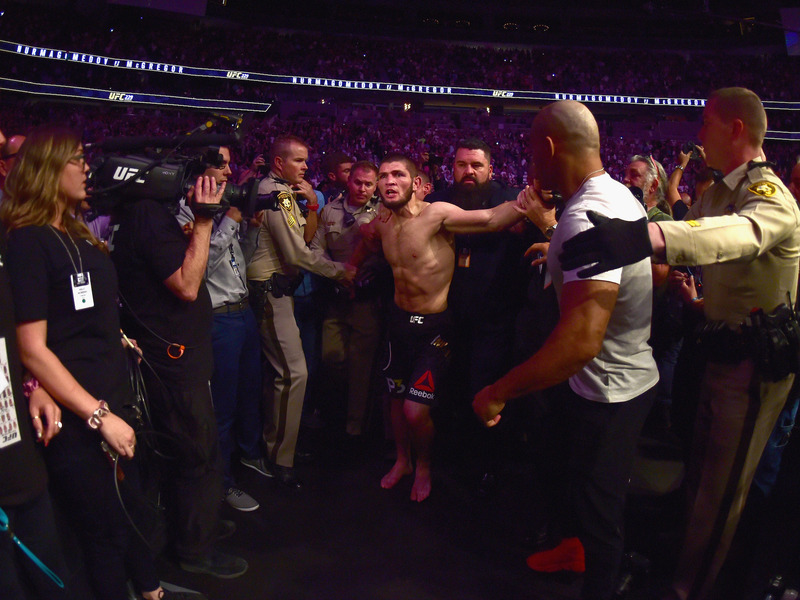 Nurmagomedov and McGregor are facing lengthy suspensions from the Nevada State Athletic Commission, pending a further investigation into the brawls. Photo by Harry How/Getty ImagesKhabib Nurmagomedov. Nurmagomedov – who called himself “the Floyd Mayweather of MMA” – is contracted by UFC but has said he was headhunted by the professional wrestling firm WWE. He could even transition into the ring for a boxing-rules contest with Mayweather, something the American seems interested in. Nurmagomedov and Mayweather both have recent victories over the Irish striker. Nurmagomedov made McGregor tap with a submission, while Mayweather stopped McGregor on his feet in the 10th round of a Las Vegas show in 2017. Mayweather scoffed at Nurmagomedov’s signature win. A crossover fight against Nurmagomedov seemingly trumps Mayweather’s plan to fight Manny Pacquiao. Mayweather defeated Pacquiao in an uneventful decision win in 2015, but Pacquiao’s knockout victory over Lucas Matthysse in July pushed him to the forefront of the fight game. The two fighters teased a December rematch on social media in September, but nothing has materialised since. Mayweather too appears to be moving on from a Pacquiao rematch and has put the ball in Nurmagomedov’s court. All the fight needs, Mayweather says, is clearance from UFC.